It was tiny, but I caught my first Widow Rockfish while third-wheeling on my best friend’s honeymoon. Read the story; it’s not as weird as it sounds. In 1988, the United States government outlawed the production and sale of three-wheeled ATVs, commonly known as “three-wheelers,” because the third wheel made the vehicles incredibly awkward and unsafe. Two years later, I was born. I grew up blissfully unaware of the ban on three-wheeled vehicles, routinely spending time with my coupled friends and making an awkward triad. Triad was also the name of my high school, but that’s just a coincidence. As I got older, I became aware of when it was okay to third-wheel with my friends, and when it was not. First dates? No. You’ve been dating for months and you’re now sitting at a basketball game? Yes. Oh. You’re going to propose at this basketball game? That’s awesome! Don’t worry, I didn’t blow the surprise. Retroactive congratulations, Shawn and Maddie Elliott! Understandably, most of my friends desired alone time with their significant other, so I tried to give them space. We all grew older, and before I knew it, it was 2014. My best friend, Benjamin Blanchard, was engaged and planning his wedding. The timing of the wedding meant our annual fall fishing trip to the Oregon Coast — that had been our tradition since graduating high school six years earlier — was off the table. I’m not going to lie, I was a little disappointed. Still, I was happy for my friend, and I absolutely understood. Then, he surprised me by saying that he and his then fiancé (now wife), Autumn, wanted us to take our fishing trip, with her, during one of the days of their nearly month-long honeymoon. Not one to turn down a fishing trip, I immediately agreed. December rolled around, and we made plans to meet up in Lincoln City where they were staying. I started my weekend with a few days in Portland before heading to the coast. Ben, Autumn and I met briefly the night before to catch up in their beachside vacation rental, where they were spending their honeymoon, before I retired to their floor. I retired to the offsite motel room they’d generously rented for me. The next day started off brisk and cold as we drove to nearby Depoe Bay, the world’s smallest navigable harbor. We climbed onto the charter boat and got to know some of our fellow passengers. Once it was discovered that Ben and Autumn were honeymooners, everyone congratulated them. While many would feel like a third wheel, I never did with these two. As we reeled in fish after fish, Autumn battled seasickness with a remarkably positive attitude. Considering the fact that we were adrift in the middle of the ocean during mid-December, it was remarkably warm. My phone listed the weather in the 50s by mid-morning. The fishing was pretty good, too, even though both Ben and Autumn out-fished me. In total, we landed more than 40 fish, representing a variety of species. 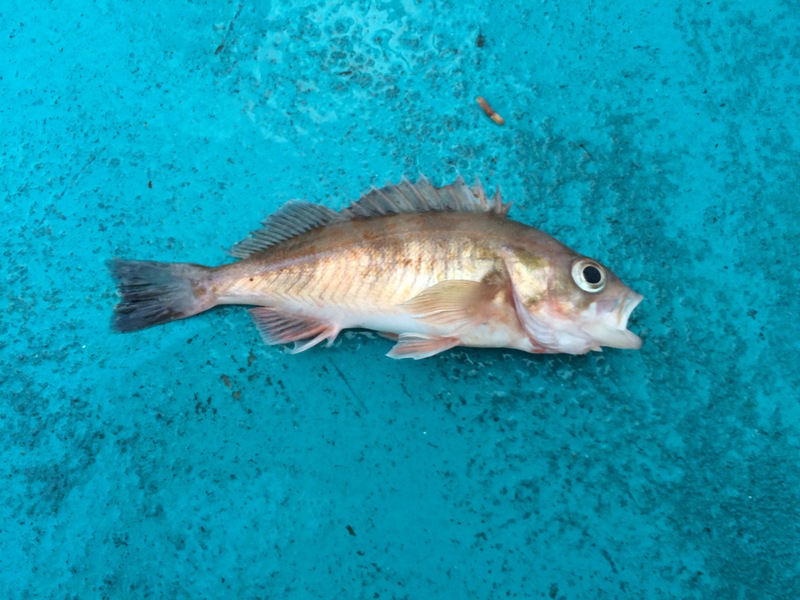 Black Rockfish, Blue Rockfish and Yellowtail Rockfish made up the majority of our catch, but we also landed several vividly orange, threatened Canary Rockfish, several Lingcod, and I even caught a species I’d never caught before: a Widow Rockfish. They survived the first stormy seas their marriage would see (literally), and we had a great time together. They never called me a third wheel, and though some of you might, I’ll counter with this: apart from the steering column, boats don’t have wheels. See the original H&N piece here. Read the next entry in #SpeciesQuest here: Species #62 — White Sturgeon.